The wait is finally over. 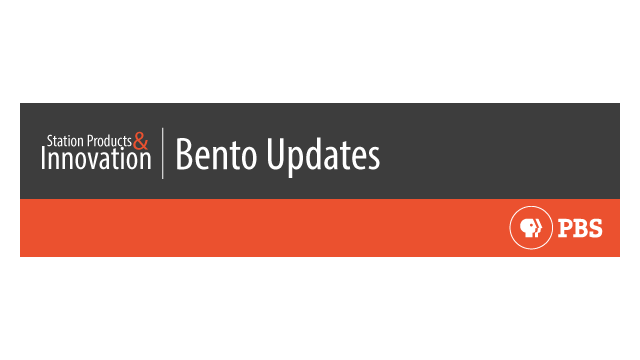 After months of development and working very closely with stations, PBS Digital will be releasing version 1 of the new Bento blogging tool. Blog users can expect a new front-end design, back-end blog entry creation and blog set-up admin, as well as detailed documentation and resources. In our latest SPI Blog post, we have outlined the information you'll need to get started using this new tool. This includes links to resources, such as how-to documentation and the recent station demo provided by the Bento product lead. Please reach out to your SPI Representative or pbsi_spi@pbs.org with any questions.